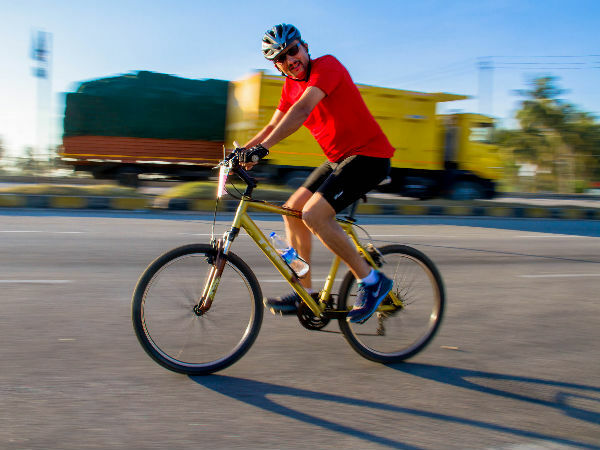 In India, it almost seems that no matter where you go, you are stuck in traffic, so it may come as a surprise to you that the country has many destinations where you can go cycling. Yes, thats right! The joys of cycling; when did you last go for a ride with the wind in your hair and a smile on your face? Does it only bring back childhood memories, along with the unforgettable falls and scrapes!? In that case you are long overdue for a cycling trip. It's good for your health and a great way to clear your mind. It is also the best way to explore the scenic beauty of various places and countrysides. Take a look at the ten cycling destinations in India! Explore the exciting sport of mountain biking in India. Among the most popular travel destinations in the country, Jaipur in Rajasthan attracts a large number of travellers, both domestic and foreign. The city has many attractions that can be best explored on a bicycle. In fact Rajasthan tour operators even offer inter-city biking. Be warned that inter-city distances can be pretty large! You can rather start off with the city attractions and outkirts. Travelling the winding narrow lanes is surely a lot of fun! The charm of French cobbled streets are best complemented with the bicycle, in fact renting a bicycle in Pondicherry is easy, all you have to do is ask at the Pondicherry Tourism Information Centre. Cycling trips are also conducted, from early morning 7:00 am to 9:00 am. A heritage tour of this lovely city topped by a nice delicious French breakfast is sure to prove unforgettable. If you live in Bangalore, we are sure you are frustrated by the daily city traffic. So this weekend, choose to do things differently, opt for an early morning cycling tour. You can choose from plenty of cycling trails in the city outskirts. Cycling in the Nandi Hills area is a popular choice, but you can also opt to cycle to Channapatna, and explore the traditional toy making industry here. Cycling tours are operated in the city on a regular basis and you can explore the countryside and even filming locations on such rides! A place of lush green tea estates, cotton candy clouds, mesmerising blue sky, smooth windng roads and chilly breeze; you simply cannot ask for more! All this is what a cycling trip through Coonoor is sure to provide you with. A fascinating experience, where you get to be close to nature and have a good time working out too! Downward journeys across the hilly roads are great fun, but be careful and yes be prepared for a mildly challenging climb as well. It sure is the best way to put your fitness to the test! A popular hill station in south India, Kodaikanal in Tamil Nadu is also a great place to go cycling. The best way to get started on cycling in Kodaikanal is by renting a cycle near the Kodai Lake and taking it for a ride around the lake. The path of 4.5 km is a good stretch and you can even rent bicycles for your kids here. If you would like to tackle more adventurous trails, go cycling on the winding ghat sections of Kodaikanal. The pleasant climate and nominal renting charges means a hassle free journey! Fun Tip: Around the Kodai Lake you can even rent dual or couple cycles that you can ride with a friend or that special someone. We cannot praise the natural beauty of Munnar enough! Carpets of green stretch endlessly into the horizon. The air is pure, the sights are fresh and the energy that surrounds this hill station in Kerala is infectious! Take a cycle tour through the smooth winding roads of Munnar, as you pass one tea estate after another, you will amazed at the beauty of this place. Great climate and interesting bird life makes the ride even more enjoyable. Avoid peak tourist season as the narrow roads tend to clog up. Darjeeling is a popular hill station located in West Bengal that offers many adventure sports activities. There are two kinds of cyling tours you can make in this lovely destination. If you are a beginner or doubtful of your fitness levels, just take a cycling tour of the city and its local attractions. If you are looking for a challenge and enjoy good fitness levels, take your bike up the hills! Some have good roads, while the rest are merely dirt tracks. Darjeeling is a destination that truly calls out to those with the spirit of adventure. Manali is a charming town that has been picturised in several movies; including the recent Bang Bang and the blockbuster Yeh Jawani Hai Dewani. It is a wonderful winter destination and you can look forward to snowfall here. The town has quaint bridges and lanes that are perfect for cycling. Explore the city on a cycle and save quite a bit of money that you would otherwise spend on hiring a jeep! It is also a great way to promote eco-tourism in the region. The more adventurous among you may be interested to know that tour operators even conduct Manali to Leh bicycle tours! The wonderful site of ancient ruins in Karnataka requires no introduction; Hampi has in recent years become an extremely popular and exciting travel destination in the state. The lands of the Vijanagara Empire ruins consisting of temples, market places, baths, halls and so much more is a feast for the senses. This is best experienced as you ride through the scenic trails of Hampi on a bicycle. Only thing to watch out for is the heat, travel during winter is recommended and of course carry your sunglasses, hat and plenty of water! The vast and exciting lands of Ladakh are explored with Leh being the starting point. Flights are only available to this little city, that itself offers quite a few attractions. Even though many travellers explore the nearby places on foot, you can also think about renting a bicycle and exploring the nearby attractions. It is indeed a great experience as you soak yourself in rich sights of monasteries and temples. Go ahead and feel one with nature!